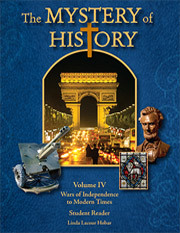 —featuring four volumes of world history for all ages. What is The Mystery of History? 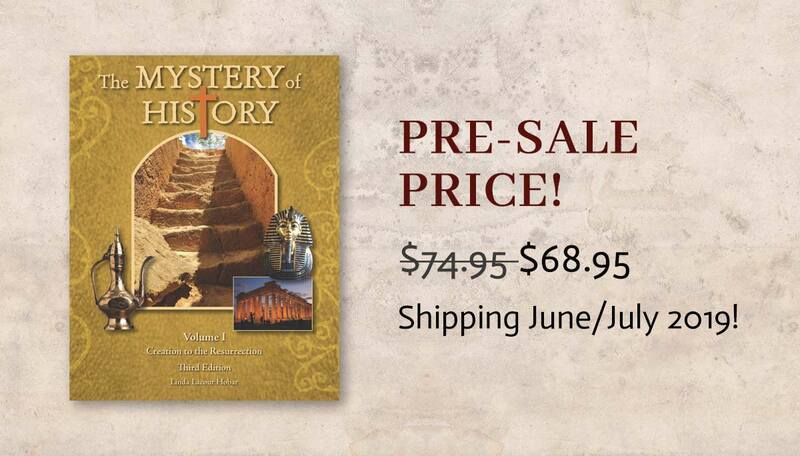 Who are we at The Mystery of History, Inc.? 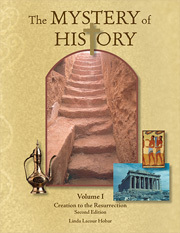 (Creation – c. A.D. 33) This volume covers world history from Creation to the death and resurrection of Jesus Christ. The text spans the incredible stories of ancient times, ancient lands, and ancient peoples. 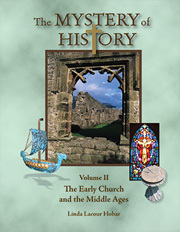 (A.D. 30 – 1456) Volume II expands on the fall of the Roman Empire and the Dark Ages that followed. Delve into the chivalry of knights and damsels, kings and queens, and the peasants who faithfully served them. Students visit Vikings and villains; castles and crusades; and the poetry of Dante and Chaucer. (1455 – 1707) Volume III will look at what was going on all over the world in the order that it happened. While the Renaissance and Reformation were taking shape in Europe, students will look at the rise of wealthy empires in West Africa; the Mogul dynasty of India; and the peaceful lives of the Aboriginals of Australia. We will also visit Ivan the Terrible in Russia and the Tokugawa family in Japan. 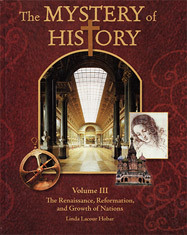 (1708 – 2014) Volume IV, the last and final volume of this world history series, spans three pressure-filled centuries from 1708 to 2014. Starting with Bach and Handel, two of four major composers included in Volume IV, the time period will see numerous “wars of independence.” From the American colonies, the heart of Mexico, the gold mines of Australia, the mountaintops of South America, the shores of Greece, and the walls of the Alamo, we will find mankind desperately striving for liberty and freedom through the eighteenth and nineteenth centuries. What does a 'Week at a Glance' look like? -anyone can use The Mystery of History. How do you 'Teach All Ages'? —all at the same time or through a repeating cycle. What are others saying about The Mystery of History? —by peeking at our awards, reviews, and fan mail! The Mystery of History Guidance Counselors are made up of experienced homeschool teachers. They are also full-time mothers who volunteer their time to answer any questions or concerns that you might have. The Mystery of History, Inc. is a small personal company dedicated to shipping books all over the world at the best rates possible. Let us serve you! Join one of our five Yahoo Groups, or follow the author on Facebook, Instagram, or Pinterest for encouragement, inspiration, and product updates! Want to join us on social media? Have an activity to share with us? Yes! Students as young as 1st grade can enjoy the stories of ancient times even more—with the addition of 400+ color images and maps in the text and updated hands-on activities (with photos). Middle students can glean even more from the Companion Guide—with enhanced activities, new photos, and improved mapping exercises. Older students can continue to adapt the program to meet a high school credit through stimulating activities and literature suggestions on a high school level. 2)	Will the Second Edition Audiobook match the Third Edition? Yes and no. With the new edition, the author had the opportunity to rewrite several words, sentences, and paragraphs. However, the author did NOT rewrite entire lessons or change the chronological order of them. So, the two editions are a close match. 3)	If I sell the hardback down the road, will the download code be reusable? No. The download code falls under a one-time family license through the publisher, Bright Ideas Press. However, a replacement code can be purchased at a reasonable price, allowing a secondary book owner to have access to the popular curriculum components. 4)	Will the Second Edition black and white paperback remain available? Once the Second Edition sells out, it will be discontinued and—by popular demand—replaced by the colorful, hardback Third Edition with a digital code for the Companion Guide. 5)	Will the “introductory pre-sale price” increase? Once the books are available, we will adjust our prices according to the market. 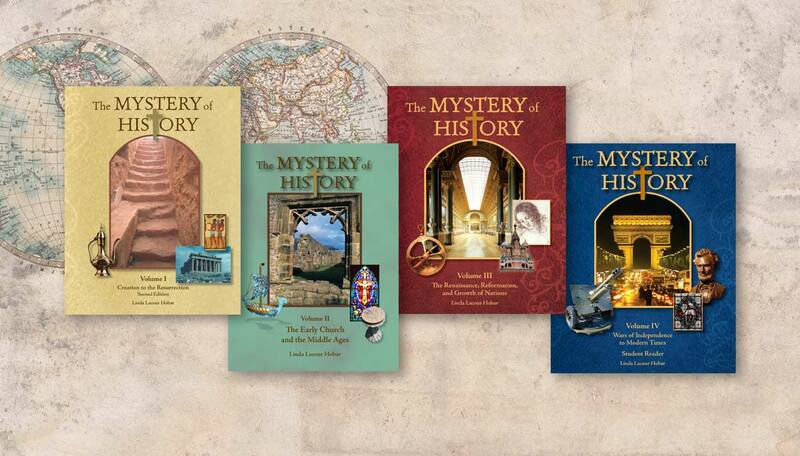 Join The Mystery of History mailing list to be encouraged and updated with Linda's posts about History, Heart, and Home. You have Successfully Subscribed to Linda's Blog for History, Heart, and Home!